Order now and receive free freight! 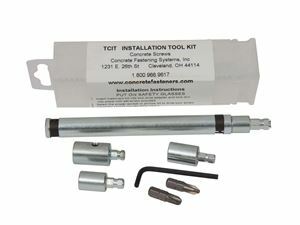 The Tapcon® Installation Kit is in stock for immediate shipping. Drilling a hole into the masonry base material is necessary. A hammer drill must be used and be set to the hammer and rotation mode. The Tapcon® Installation Kit has an adaptor that fits into the chuck (one that uses a chuck key) of the hammer drill and holds the Tapcon® bit in place. After drilling the hole, slide the sleeve part of the Tapcon® Installation Kit over the top of the bit, which will be held in place by compression. Bits are not included in the Tapcon® Installation Kit. However, the convenient plastic holder provides space to carry different sizes of Tapcon® bits.